Chris Trinidad is humbled and honoured to join the founding leadership team of Cristo Rey De La Salle. He has discerned that the core purpose of his work is to accompany and encourage people to pursue their vocation through a transformative education. Chris began his teaching career in Vancouver, British Columbia, where he was born and raised. 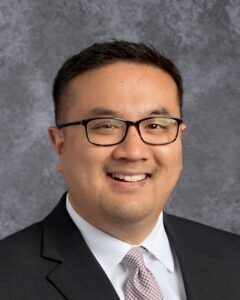 He became a San Francisco Bay Area transplant ten years ago and subsequently served as a Lasallian educator and partner-in-mission in various capacities at De La Salle High School in Concord and at Saint Mary’s College High School in Berkeley. Chris’s eclectic formal education includes work in Jazz Studies (Capilano University) and Music Education (University of British Columbia), Theology and Liturgical Studies (Jesuit School of Theology of Santa Clara University), and Educational Leadership (California State University East Bay). In addition to his work in education, Chris is a freelance live performance multi-instrumentalist and studio musician who collaborates with multiple Bay Area artists. Finally, Chris is a lifelong Vancouver Canucks hockey fan who will never be found cheering for the San Jose Sharks!